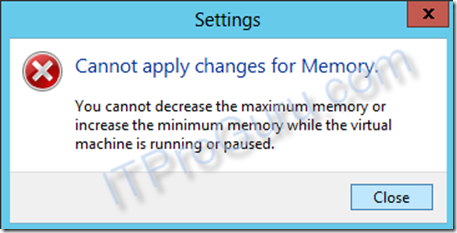 Dynamic memory was introduced in Windows Server 2008 R2 with SP1. It gave the Hyper-V hypervisor the capability to dynamically adjust the amount of memory assigned to a machine based on memory demand. The reason we would want to do this is simple. If we can put only the amount of memory a machine needs in the box, we can fit more machines on a host. How’s that? When you deploy a server you give it the amount of memory you think it will need at it’s maximum load. So if when the server is the busiest it needs 4gb of memory it will have what it needs. But, what if that server is only busy for an hour a week? That is a waste of the 4gb of memory. Dynamic memory allows Hyper-V to “Dynamically Reallocate” that memory to other servers that may need it. Then when it needs the memory it can simply dynamically reallocate it back. An important concept that you need to know about dynamic memory is that it is not the same as “memory overcommit.” Dynamic memory is a much more accurate term to use for it because Hyper-V dynamically “allocates” memory based on workload “demand” In this article, all of these terms and distinctions will be clearly defined. Hyper-V DOES NOT OVERCOMMIT! One of the biggest problems with “memory overcommit” is what happens under memory pressure. When a server runs out of memory it pages (swaps to disk). This is a very costly (slow performance) transaction so Hyper-V will not page at the host (with one very small exception shown below). If there is going to be paging it has to be at the guest and only on the lower priority servers. Dynamic memory is constantly managing memory. Some call this a disadvantage because it is always working. I do not see it that way. I actually see it as a huge advantage. First, the probability of getting in a low memory state is much lower because Hyper-V is constantly watching demand and tweaking things for optimum performance. Second, when there is memory pressure it does not have to do all that extra work to sort things out while in a starving situation. Finally, causes minimal overhead to keep memory managed as opposed to getting memory under control when you have no memory to work with. The most important thing to understand about Dynamic memory is that you can run more virtual machines with it. Let’s say you have a 32gb of physical memory in your server; you look at task manager and you see that you are using 31gb or memory. If you have another machine that needs 2gb of memory can you start it? Answer: YES! 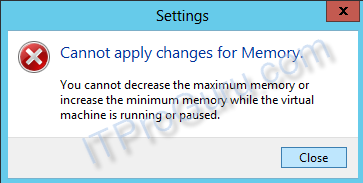 Hyper-V will simply take “buffer” memory away from other machines to give you the memory you need to run the machine. If you need to start another 4gb server can you? Answer: Yes! As long as you have physical memory you can start more machines. Hyper-V will grab buffer memory first, then available memory and finally it will grab real memory from lower priority machines to give you the memory you need to start your machines. If you do not have any of these (Hopefully you do not run things that tight), then the machine will not start. You may then have to restart the server, once you do that, the newest integration components will be available including Dynamic Memory. In the previous version of Hyper-V, Dynamic Memory included “startup memory,” which is defined as the minimum amount of memory that a virtual machine can have. However, Windows requires more memory during startup than the steady state. Some of the virtual machines are assigned extra memory because earlier versions of Hyper-V cannot reclaim memory from these virtual machines after startup. The startup memory value is the amount of physical memory Hyper-V MUST have before it can start the machine. Hyper-V will reserve this amount of memory to the machine for startup. In some cases, you might want to give a machine more memory to start so it can complete startup processes faster. With Windows Server 2012, you can now give it the memory it needs to be quick then just let Hyper-V take it back when it is done. Startup RAM can ONLY be defined/changed while the machine is OFF. Because a memory upgrade requires shutting down the virtual machine, a common challenge for administrators is upgrading the maximum amount of memory for a virtual machine as demand increases. For example, consider a virtual machine running SQL Server and configured with a maximum of 8 GB of RAM. Because of an increase in the size of the databases, the virtual machine now requires more memory. In Windows Server 2008 R2 with SP1, you must shut down the virtual machine to perform the upgrade, which requires planning for downtime and decreasing business productivity. With Windows Server 2012, you can apply that change while the virtual machine is running. Fast-growing organizations whose workloads are rapidly expanding often need to add more virtual machines to their host processors. These organizations want to optimize the number of virtual machines they can place on a host server to minimize the number of expensive host servers that they need. With the Hyper-V Dynamic Memory improvements in Windows Server 2012, IT administrators can now allocate virtual machine memory resources more efficiently and dramatically increase virtual machine consolidation ratios. Note: The buffer is not maintained when there is not enough physical memory available in the computer to give every virtual machine its requested memory buffer. Note: You can change change the buffer while the machine is running. 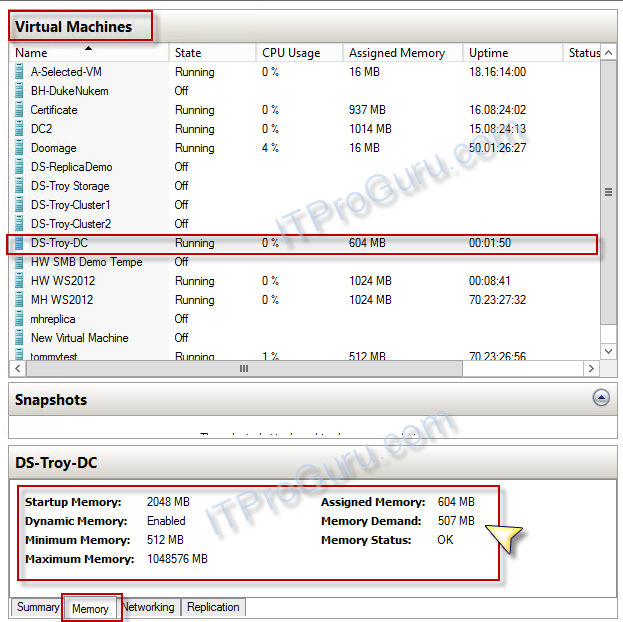 Memory Weight provides Hyper-V with a way to determine how to distribute memory among virtual machines if there is not enough physical memory available in the computer to give every virtual machine its requested amount of memory. The higher the weight the higher the priority of that virtual machine. As an example, if a high priority machine has a higher demand than can be provided by available memory, Hyper-V will take memory away from a lower priority machine (starving the lower priority machine) to give the higher priority machine the resources it demands. Note: You can change the weight while the machine is running. Memory demand is how much memory your guest server needs. Memory assigned is how much memory Hyper-V has allocated to your virtual machine. Memory status is an indicator to let you know of the health state of the memory of the machine. If the status is OK then the assigned memory is higher than the demand. However, you status can go into a warning state as the demand increases above what Hyper-V has assigned. Remember, this can happen if the host is out of memory due to higher priority machines taking memory reserves away from this machine. Hyper-V Smart Paging is a memory management technique that uses disk resources as additional, temporary memory when more memory is required to restart a virtual machine. This approach has both advantages and drawbacks. It provides a reliable way to keep the virtual machines running when no physical memory is available. However, it can degrade virtual machine performance because disk access speeds are much slower than memory access speeds. Ok, I said above Hyper-V DOES NOT OVERCOMMIT! Well, this is THE ONLY exception to the rule and it is only for a very limited time and reason! No memory can be reclaimed from other virtual machines that are running on the host. What if you are just OUT of physical Memory? There will come a time when you simply have more workloads running that you have resources to run so what happens. Hyper-V continues to rely on internal guest paging when host memory is oversubscribed because it is more effective than Hyper-V Smart Paging. With internal guest paging, the paging operation inside virtual machines is performed by Windows Memory Manager. Windows Memory Manager has more information than does the Hyper-V host about memory use within the virtual machine, which means it can provide Hyper-V with better information to use when it chooses the memory to be paged. Because of this, internal guest paging incurs less overhead to the system than Hyper-V Smart Paging.